Enjoy an audio guide made available to you at the start of your visit. The guide is available in 11 languages, so you can visit the Palace and learn about France's royal history. Visit the King's chambers with their elegant décor, and the grandiose Hall of Mirrors, which was once a reception hall overlooking the immense gardens of the palace. The Trianon Estate estate includes the Petit Trianon, Grand Trianon, the gardens and the Queen's Hamlet. 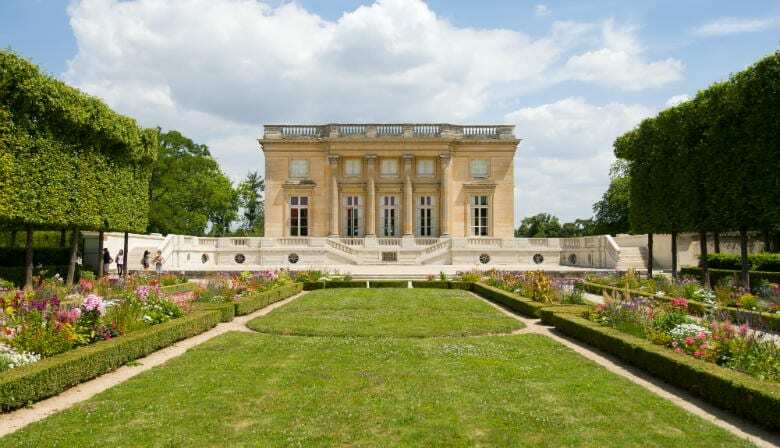 The Petit Trianon Château was built by Madame de Pompadour, but it was Marie-Antoinette who decided to make it a residence far from the hustle and bustle of royal daily life. Its elegant paneling makes for sumptuous décor. Built in 1783 in the style of a Normandy village, the Queen's Hamlet was a haven for Marie-Antoinette, who often retired there to escape courtyard pompousness and enjoy a simple peasant lifestyle. It is made up of 11 houses—each with a garden—built around a lake. These were dwellings for the Queen, her guests and peasants. The Queen also partook in boating and fishing, embarking from the Malborough Tower. Visit the complete Versailles Estate at your own leisure with this one-day pass: Versailles Palace with audio guide, the Trianons, Marie-Antoinette hamlet and the gardens with the great Musical Fountains. Stroll through the Palace's park and admire the beauty of the planted greens and sculptures lining its fountains and reflecting pools. In summertime (April–October), a magnificent Musical Fountain Show takes place every weekend. The park's fountains come to life against a background of baroque music, transporting you back to the royal era.